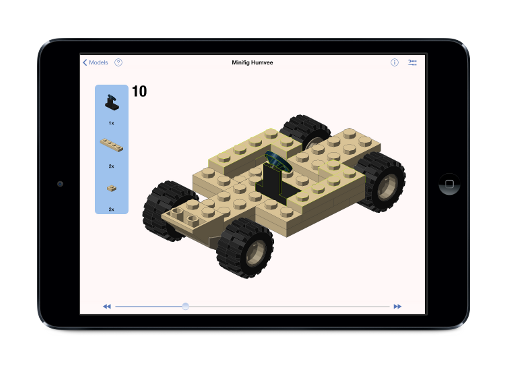 Make the most of your LEGO® collection and view 3D LDraw/LEGO models and instructions on your iOS device. BrickPad allows you to view and manipulate 3D LEGO models and instructions that have been created using the LDraw parts library. You can rotate, pan, and zoom the model while paging through the modeling instruction steps. Ideal for LEGO lovers of all ages. The LDraw parts library is a collection of LEGO pieces that have been modeled by fans of LEGO. It is freely available and included with BrickPad under the Creative Commons Licence. Please visit www.ldraw.org for more information, content, and models. Open LDraw models in BrickPad from other iOS Apps like Mail and Dropbox. Parts list as well as in step parts list bubble.